Future Essentials 50 Matchbooks in Vacuum-Sealed Can | BUDK.com - Knives & Swords At The Lowest Prices! Matches stay dry in floods, rain, etc. Must-have for preppers, outdoorsmen, etc. Produced and packed in the USA by emergency preparedness experts Future Essentials, these cans are sealed with the company’s advanced vacuum sealing/canning process, and the contents are crucial for surviving any natural disaster, political crisis or other emergency. But it’s not food! 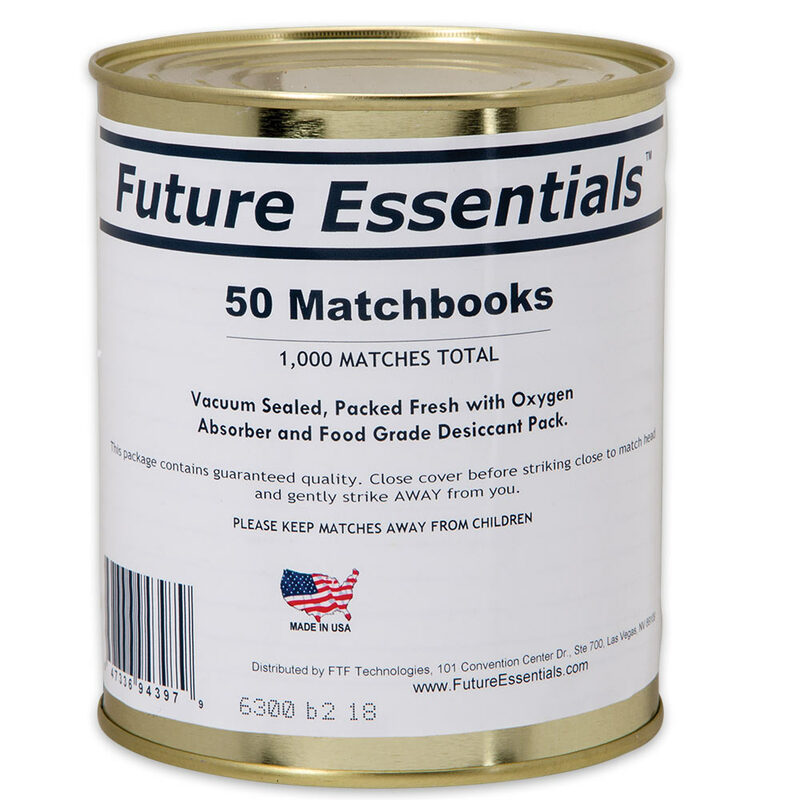 Long renowned for its tasty, incredibly long-lasting canned food staples, Future Essentials has cleverly used its industry-leading technology and knowledge to protect matches - every bit as critical as food in a crisis scenario. Fifty matchbooks - totaling 1,000 matches - are vacuum-sealed into each can, along with oxygen absorbers and food-grade desiccants. Come what may - floods, torrential downpours, earthquakes and more - these easy-to-light matches will remain dry and effective, ready to light your lantern, cooking stove, gas heater or campfire. Just as this cutting-edge vacuum-sealing/canning combination technology gives Future Essentials food extraordinarily long shelf-lives, it also adds decades to matches’ lives. While vacuum-sealing alone (using plastic bags and the like) affords matches around a three-year shelf-life, Future Essentials’ exclusive vacuum-sealing/canning combo process gives these matches an incredible 30+ year lifespan! With decades of reliability and our unbeatable low prices, there’s no reason to stock your emergency shelter or crisis caches with anything else! Start today, and be ready! After all, when conditions get rough, ordinary matches and cigarette/grill lighters will fail you every time. But not Future Essentials canned matchbooks! You can lean on them for that all-important flame no matter how grim things become.